Lazar Markovic sat down with Sky Sports this week to select his one2eleven – an XI of the best players that he has played with so far in his career. The Serbian winger, on loan at Fenerbahce from Liverpool this season, had played for Partizan Belgrade, Benfica and his national team before moving to Anfield. The 21-year-old hasn’t played for long enough to have that many players to chose from, and yet only two current Reds made it into Markovic’s best XI. Philippe Coutinho and Martin Skrtel are the two who make the grade. Ex-Liverpool teammates Steven Gerrard – obviously – and Glen Johnson – surprisingly – are also in. Is that an indication of the lack of quality currently in the Reds squad, or sour grapes after Markovic failed to make much of an impression last season? Markovic squeezing compatriot Nemanja Matic in on the right wing – instead of Adam Lallana who kept him out of the Liverpool side – hints at bitterness. And Zvonimir Vukic, who Markovic played with briefly in his Partizan days, is a strange choice to partner Robin van Persie up front instead of Daniel Sturridge. But many of the other selections are justifiable. Jan Oblak, Luisao, Guilherme Siqueira and Nicolas Gaitan all featured in Benfica’s run to the 2013-14 Europa League final. 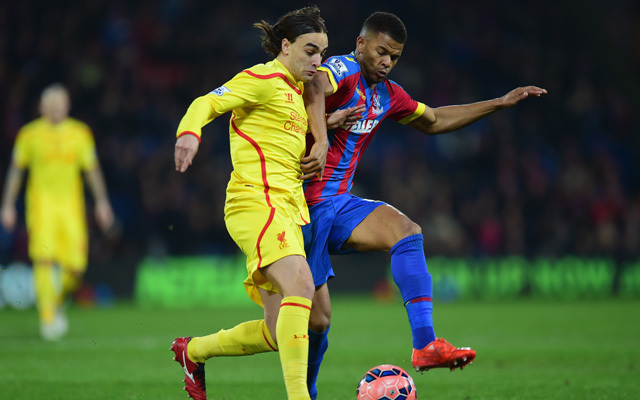 Markovic is expected to be part of Jurgen Klopp’s plans when he returns to Merseyside in the summer. Hopefully there will be more Liverpool representation when he picks his one2eleven in five years time.